You’ve spoken, and we’ve listened! Garfield and I share one thing in common: Lasagna is our love language. Who knew it’d blossom into this lifelong love affair with this heavenly Middle Ages Italian culinary creation? Whenever we eat out, we try our best to order a dish we’ve never tasted before. But every time we visit an Italian restaurant, I simply couldn’t resist the temptation to taste their expression of this glorious culinary work of art. The rich multitude layers of sweet-savory-tart-umami flavors and chewy-creamy-gooey-cheesy-toothsome bites. Each inviting slice of heaven is so indescribably comforting & satisfying. Make Mouthwatering Instant Pot Lasagna. Heavenly rich pressure cooker lasagna packed with creamy-cheesy layers of satisfaction. Your family will cheer for this lip-smacking good easy dinner! 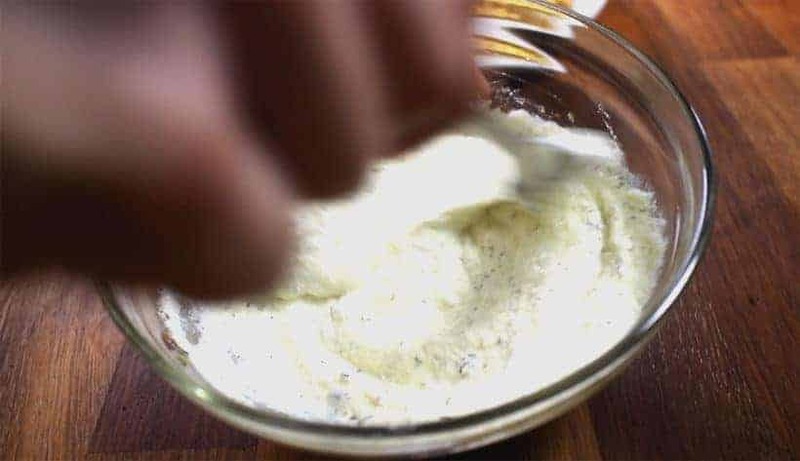 Create Ricotta Cheese Mixture: In a mixing bowl, beat one large egg, then add in ¾ cup (200g) Ricotta cheese. Season with 1 tsp (1g) Italian seasoning, ground black pepper, and ⅓ tsp kosher salt. Assemble Instant Pot Lasagna: Line a 7-inch springform pan with cut-out parchment paper (optional). Break the uncooked oven-ready lasagna noodles into smaller pieces, then layer them at bottom of the pan in a single layer. Layer ⅓ portion of the meat sauce on the lasagna noodles. Layer Ricotta cheese mixture on the meat sauce, then add shredded mozzarella cheese on top. Repeat this layering cycle twice. Add ¼ cup (30g - 40g) freshly grated Parmesan cheese on the very top. Then, wrap the springform pan tightly with aluminum foil. 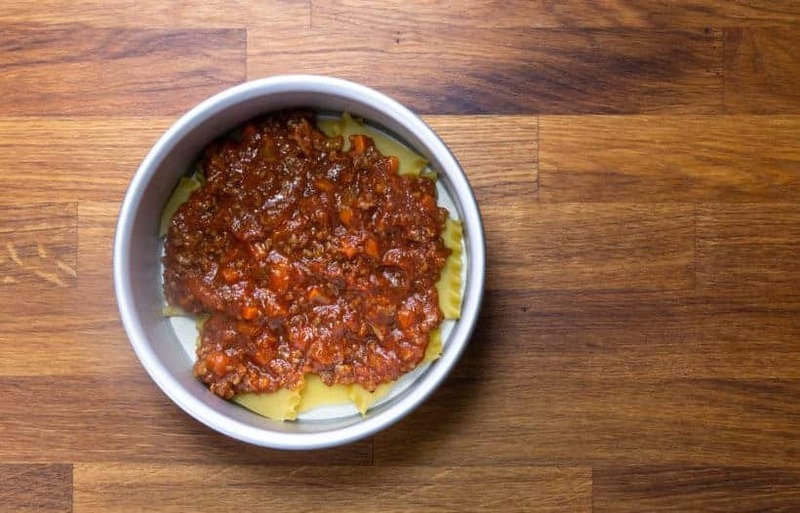 Pressure Cook Lasagna: Pour 1 cup (250ml) cold water, then place a trivet in Instant Pot. 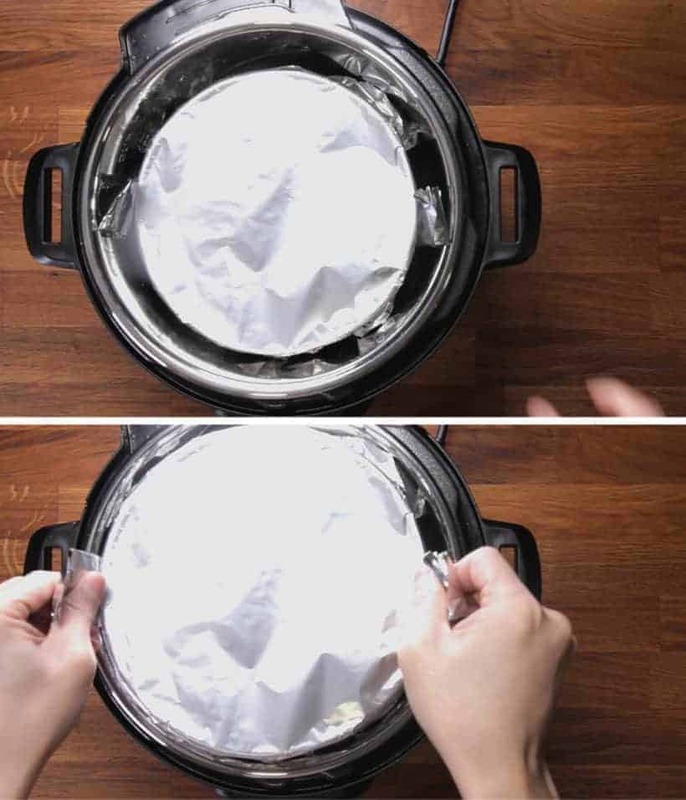 Create a sling foil, then place springform pan in Instant Pot. Close lid, then pressure cook at High Pressure for 24 minutes + 10 minutes Natural Release. Optional Broil Lasagna: Preheat oven to 425°F when Instant Pot is natural releasing. Place the cooked lasagna in a 425°F oven until the cheese is browned on top (~7 - 9 mins). Note: If using springform pan, wrap the bottom of the pan in foil to prevent leakage. 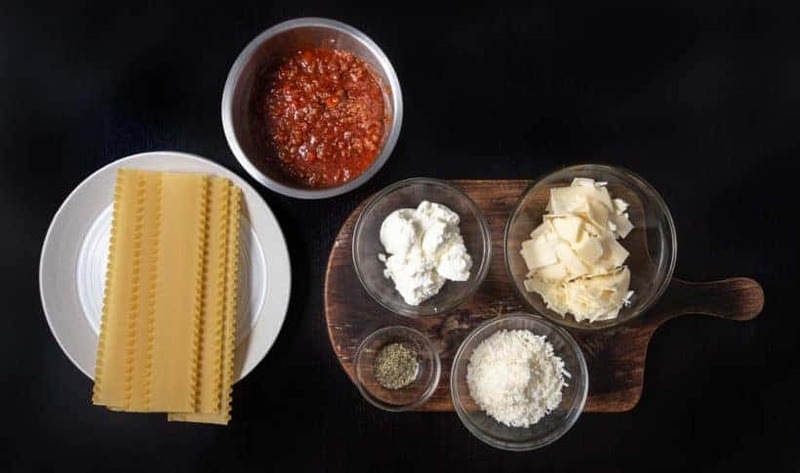 Here are the ingredients for Instant Pot Lasagna. Any spaghetti sauce will work. 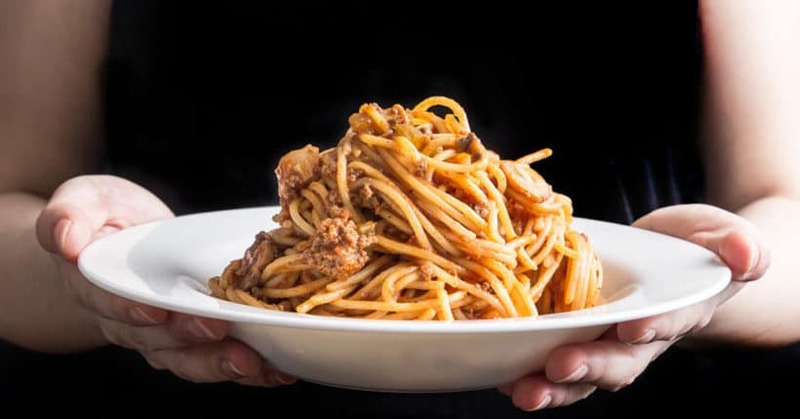 Here is our Umami Spaghetti Sauce recipe that goes perfectly with this dish. In a mixing bowl, beat one large egg, then add in ¾ cup (200g) Ricotta cheese. Season with 1 tsp (1g) Italian seasoning, ground black pepper, and ⅓ tsp kosher salt. Optional: line a 7-inch springform pan with cut out parchment paper. Break the uncooked oven-ready lasagna noodles into smaller pieces, then layer them at bottom of the pan in a single layer. Layer ⅓ portion of the spaghetti sauce on the lasagna noodles. Layer Ricotta cheese mixture on the spaghetti sauce, then add shredded mozzarella cheese on top. Then, repeat this layering cycle (Lasagna Noodles-Spaghetti Sauce-Ricotta Cheese-Mozzarella Cheese) twice. 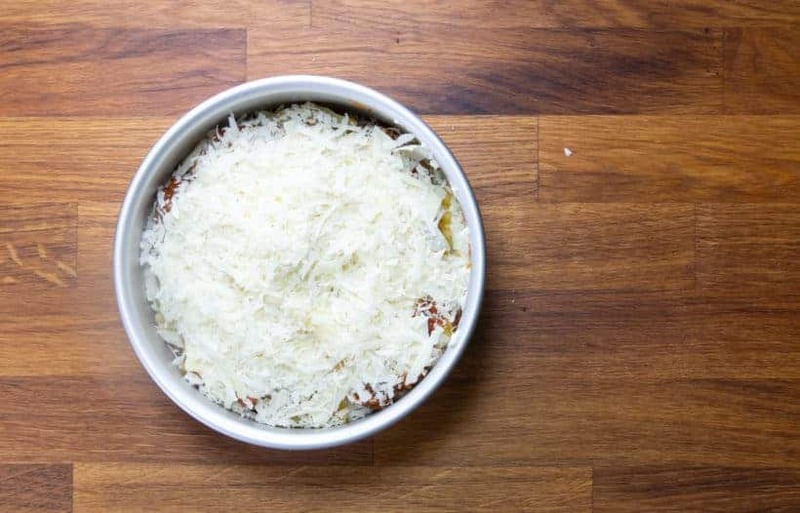 Add ¼ cup (30g – 40g) freshly grated Parmesan cheese on the very top. Then, wrap the springform pan tightly with aluminum foil. Pour 1 cup (250ml) cold water, then place a trivet in the Instant Pot. Create a sling foil, then place the springform pan lasagna in Instant Pot. After 10 minutes natural release, turn Venting Knob to Venting position to release the remaining pressure. Preheat the oven to 425°F when the Instant Pot is natural releasing. 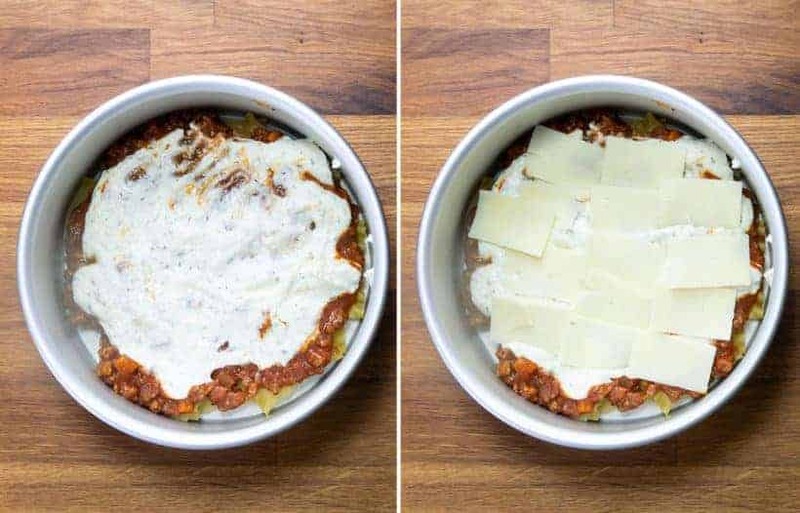 Place the cooked Instant Pot Lasagna in a 425°F oven until the cheese is browned on top (roughly 7 – 9 minutes). 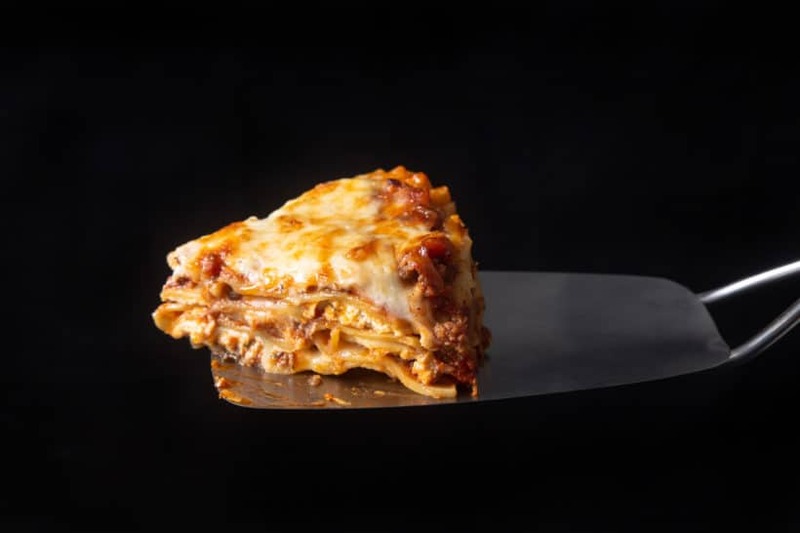 For an easier release, use a paring knife to gently release the Lasagna from the springform pan (as shown in below photo). 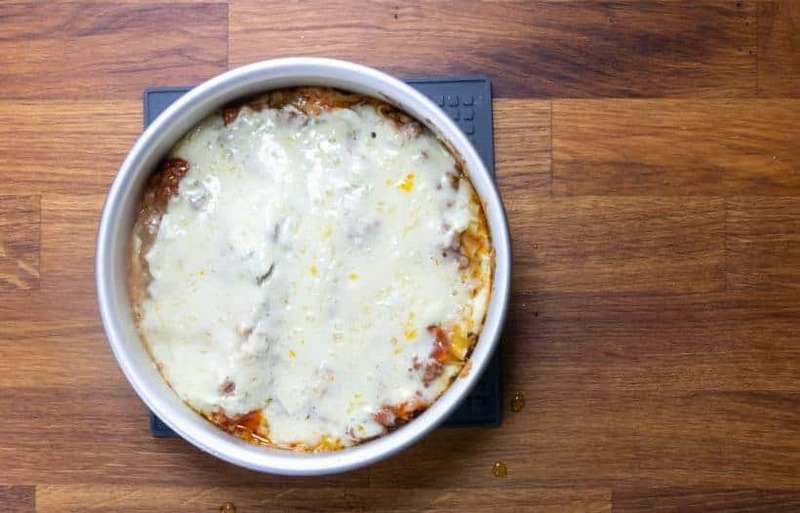 If you are using a Fat Daddio Cheesecake Pan with Removable Bottom for this recipe, you can place a mason jar at the bottom of the pan, then push down the pan to take out the Lasagna (as shown in above photo). Used my IP mini and I changed a couple of things (besides using less of everything) to make it meatless for this Friday. I used 1 small eggplant sliced (salted for 10 min. then rinsed) and because I didn’t have ricotta cheese, I substituted it with greek yogurt ( homemade using your recipe). I still mixed it with the egg. I used parchment paper on the bottom but forgot to wrap the bottom in aluminum foil. Luckily, everything stayed in my 6 in. Fat Daddio cheesecake pan. IP 24 minutes plus 20 min NR, and now I am going to bake it now so it looks beautiful like yours! Great lasagna! A definite keeper. Followed recipe exactly. Used linked meat sauce recipe and homemade ricotta. Perfection. I really enjoy your recipes. Another option that makes serving the lasagna easier is to prepare in a spring form pan. It really works great. My husband and family LOVED it! Great recipe!! I can’t believe how quickly and easily I can make lasagna on a weeknight. Delicious right from the Instant Pot — no baking necessary. I used your sauce that I had made and frozen a few days before, and it provided so much flavor. I will make this often. Thank you for your wonderful recipes. I am a fan. I made this for dinner with left over spaghetti sauce with ground beef. My family really enjoyed it. We have no leftovers and could have used a few more bites! It was so easy to assemble and is much healthier than the usual frozen lasagna I serve. Thanks for the recipe! Made my first lasagna in the instant pot today using your recipe, it was wonderful and delicious. Can always count on you guys for a good recipe. just got a mini duo this morning and want to try your recipe, would the cooking time be any different in the mini? The cooking time is the same, but you can add 1 – 2 minutes just to be safe. Yum ! I did not have a springform pan so I fashioned all of the accessories out of foil and parchment paper. It worked, but I have those items on order from Amazon. This was really easy and very tasty! It’s a really nice sized lasagna for two people. I plan on making it again, AND check out more of yoour recipes. Have made this recipe several times. It is to die for. I use a spring form pan with parchment paper on the bottom. I start by putting a layer of sauce first on the parchment paper..I use bottled sauce that I have added my own spices, onions and garlic to. I spray olive oil on the foil before putting it on top of the lasagna. I don,t make a sling, I just put it on the rack that came with the instant pot. My springform pan is too big for my instant pot. Any ideas of what I can do? I was thinking of just lining the instant pot with foil all the way around, that way I will have foil to lift it out of the pot. 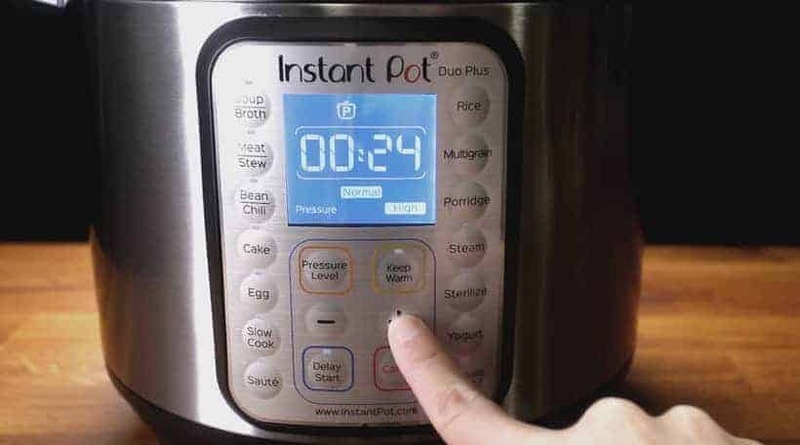 I’m new to the instant pot, so any suggestions are welcome. I can’t wait to try this. I recommend getting the Fat Daddio pan that fits perfectly in the Instant Pot. I made this last night for the family and it was a huge hit! I modified slightly by using homemade sauce, and adding a layer of thinly sliced zucchini and a layer of fresh spinach. I also tripled the recipe and made 2 7″fat daddy push pans and 4 mini loaf pans, cooking in 2 batches (1 push pan topped by 2 loaf pans). I did add 2 minutes to the cook time. The loaf pans are perfect portions for leftovers!!! I will definitely be making this one again! I made this lasagna using the instant pot spaghetti meat sauce (also from Amy & Jacky) and it was sooooo good. I love this because of it’s really delicious flavor and texture. It’s worth it to spend a little extra time to make the sauce from scratch. The ratio of cheese, sauce and noodles is just right. A few minutes under the broiler to brown the top and it’s perfection. I’ll definitely make this again. My husband said it may be the best lasagna yet! Happy to hear your husband enjoyed it. Thank you for this recipe, delicious! Company loved it! Actually quite similar to my oven version. All your directions are very clear & precise. I did add spinach to the cheese mixture & replaced the ricotta cheese with cottage cheese, otherwise followed your directions. I made 2 & froze the second one. My question now is how do I thaw/ reheat it in my IP? I’ve done a search but haven’t found the answer. Thank you. You can place it on a trivet and reheat it in the Instant Pot. It will probably take 15 minutes to reheat the whole thing. I made the lasagna tonite for supper we loved it turned out perfect ,first try ! Hi! 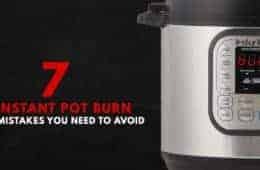 I used a springform 7” pan all wrapped in foil, the cup of cold water and the trivet just like the recipe said and yet after my Instant Pot heated up and had gone into the timed pressure cooking stage (2 minutes in), my Instant Pot said “food burn” and stopped. I opened it, added more water to the bottom and started it again – the same thing happened after 15 minutes this time. Could you please tell me what I am doing wrong? Thank you! Were all the water evaporated? It sounds like the Instant Pot was not sealed properly. Flavor was great !! I will make again if you can advise why my noodles were hard. I used oven ready. Please help. It seems to happening on some brand of oven-ready noodles. I am thinking some of the oven-ready noodles brand will require a longer time due to the difference in ingredients. Just made this. It’s was was very good and easy to do. Who knew you could do lasagna in a InstaPot. I made a bolognese sauce a two days before and used it as my meat sauce. Will make again. OK so this probably a really dumb question. I do not have a spring form pan so I am just thinking to build this lasagna in the instant pot without it! I know you won’t be able to turn it out but I am hoping you will be able to dip it out with a long handled spoon. Do you think it will work? You will need a springform pan for this recipe as you will not be able to build up the pressure by placing the whole thing in the Instant Pot. Very simple to make and delicious! Clear instructions and step by step pictures were very helpful. I’m making the butter chicken next! This was my first lasagne with my relatively new Instant pot. See if there other recipes to use, this one turned out great! 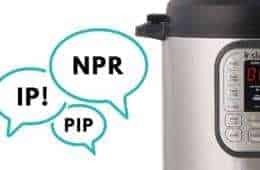 I really love my Instant Pot! Thanks again! One of the best ever made. Used good quality cheese. Excellent. I used Barilla oven ready noodles making sure to cover completely with sauce. After reading other reviews I set the time for 29 minutes, put under the broiler for 6 minutes and let rest for 15 minutes. It came out picture perfect. Next time I will not use the parchment paper. Thanks for a great recipe. In your instructions, you suggest wrapping the pan if using a springform pan. I have a Fat Daddio’s “push pan,” just like the one you show in your pictures. It doesn’t look like you have the bottom of yours wrapped, so am I correct that the push pan doesn’t need the bottom wrapped (I realize there’s likely no harm in doing so, but just want to make sure I understand how to interpret your instructions). Thanks! 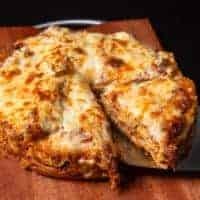 I’ve made several of your recipes, and have loved them all! No wrapping 🙂 We added a parchment paper at the bottom. I also LOVE lasagna, and this recipe is my favorite by far! However, I made one change since the palates in my house are not very broad… Instead of using the ricotta cheese mixture, I simply used shredded mozzarella and shredded Parmesan cheeses where the recipe calls for the ricotta. It was PERFECT! This is a recipe that will be in my regular rotation. Thank you! One of my favorite Instant Pot recipes! Makes just enough for two people! It says it serves 4 but we never have leftovers! This recipe is easy, time-efficient, and incredibly tasty! Great job! I have been working through Amy and Jacky’s enormous recipe collection and attest that every recipe produced an incredibly delicious result. The photographs are quite helpful and beautiful. 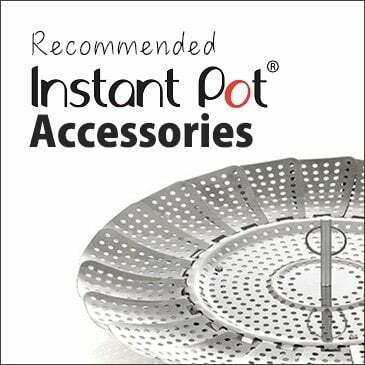 I have even taken advantage of A&J’s recommendations for Instant Pot accessories. Love this website! I made the recipe last night. It was so good. My original print out did not reference to use meat sauce. But I decided to look at the step by step guide to assemble. I had frozen meat balls that I heated separately. Next time I will chop them up and mix with my sauce. I have 1/2 the cheeses left to use for another night. I used 8 pieces of Barilla’s “Oven-Ready Lasagne” (9oz, 255g) which are 6 5/8 inches in length. I used the 7 inch Fat Daddio push pan in my 6 quart IP Duo. I did use parchment paper on the bottom of the pan, but next time I think I will use aluminum foil instead as the paper was soggy. I used the 24 min cook time and the 10 min natural release. No pressure remained and I was able to open the lid. I left it sit another 10 min before removing it from the pan. The hint to sit the pan on a mason jar to aid the removal worked great. I did have my hubby help at that point. Since we are in a motor home with no oven I did not brown. It was fine without that additional step. I love all your recipes and have been trying out your recipes successfully on my Mealthy Multipot except the Lasagna. It’s been my greatest challenge to date and is giving me grief. I have tried the lasagna twice on my Multipot. Both times, the lasagna noodles was 3/4 cooked and when removing from the springfoam pan, it is a gooey mess. But it is super super delicious and is eaten within the next 30 minutes by my family. I am not sure what I am doing wrong for the lasagna to be uncooked and it being a a gooey I have tried your other recipes and have 100% success so far. Would be able to give me some suggestions? Thanks for your time!! Hope you had a wonderful New Year 🙂 Thank you so much for your love and support. It could be the brand of noodles. I recommend trying a different brand and see how it goes. Only my second recipe in the Instant Pot. It was delicious. I didn’t have a “meat sauce” just a meat flavored sauce so I put a layer of pepperoni in the last layer (was going to put it in each layer, but was concentrating on the recipe and forgot until the last layer). It was great. Getting it out of the cheesecake pan was a mess, but it cleaned up. I found the parchment paper in the bottom to not be a lot of help. Thanks for the recipe. A layer of pepperoni sounds great!! This was my first lasagna in an Instant pot and it was delicious! I have the three little 4″ springform pans from Wilton. I am going to put these on top of the trivet, above the level of the water required for the pressure. I am hoping these will work to make little mini single-serving lasagna and also cheesecakes and maybe even egg casserole type things. Do you think these will work? ANY advice you have is appreciated. Also, will a 7″ springform pan fit into a 6Qt Duo Instant Pot? I notice that the stainless steel inner pot might be wider than is the ceramic one (I am using the ceramic one currently). Is that so? Thank you for your question. The 4″ springform pans will work just fine. A 7″ springform pan will work just fine as well! Your recipes are written so well and precise with great pictures for easy to follow instructions. I’ve tried many recipes from you guys and all have been wonderful. I just made your lasagne tonight and it tasted wonderful. Thank you for all you guys do to bring great food to our tables! Btw, being Cantonese/HK Chinese like yourself, I look forward to your Cantonese traditional recipes. It’s like a piece from my childhood. Would be great when you get the recipe for sticky rice w/meat in banana leaf like in dim sum. Thank you so much for your kind words and feedback on the recipe! Lo mai gai is on our super long to make list. 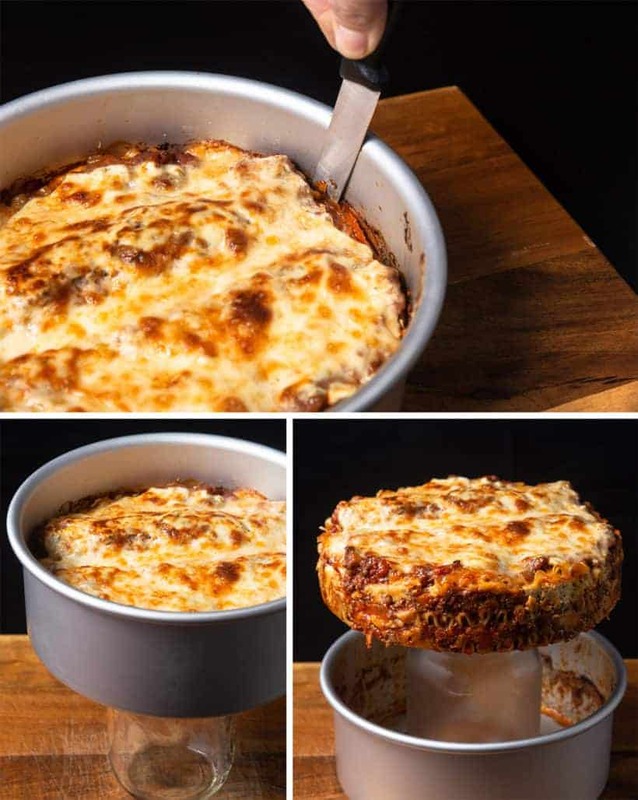 Can I use a 7” porcelain soufflé dish to make the lasagna in my 6 qt instant pot. I used it before for cheesecake and it turned out good. Do I need to add extra time to it? And if I freeze it un cooked how much extra time should I add for cooking it. Thanks. Thank you for your question. You will probably want to increase the cooking time by 8 minutes. Hehe, further testing is needed for frozen lasagna timing. Thank you for your question. Browning the ground turkey first will make the sauce more tasty! How would I adapt this recipe to fit bigger stackable pans? I have a family if seven. I have the 8 quart duo. What other adjustments such as coomtime would I need to make? I am so anxious and excited to try this! Thank you for your question. You will want to 1.5x the recipe. The cooking time will probably has to increase by 30%. My springform pan was too big for my 8 qt instant pot so I used a deep metal mixing bowl and crossed my fingers. 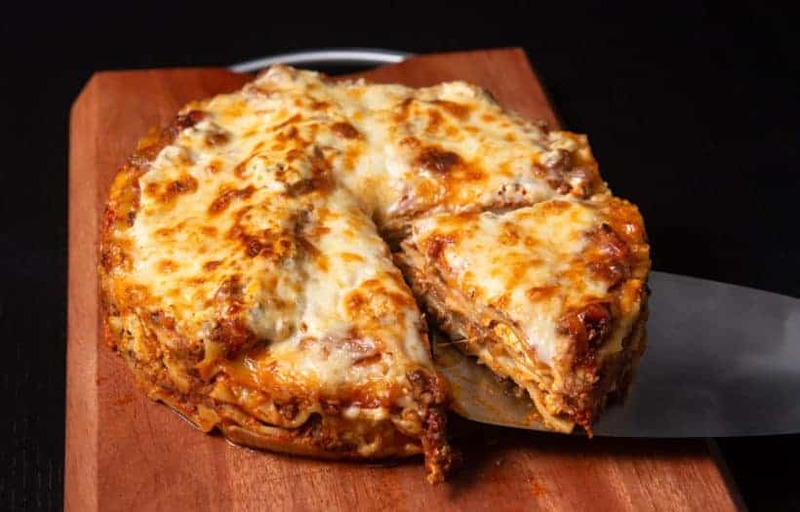 It worked great and my family loved the taste and texture of the lasagna. The metal bowl did fine under the broiler too. I added a lb of scramble fried ground beef & chopped onion to the sauce. I also added some frozen spinach to the cottage cheese. So yummy! Will definitely be making this again😊! Can you use the boil lasagna and if you do do you cook it first or just let it soak for 10 minutes before putting together. Thanks. That is all I have in the house. Hope you had a wonderful Christmas Holiday 🙂 Thank you for your question. I will cook the noodles (75% cooked) first and let it dry a bit before putting the Lasagna together. If I were to substitute cottage cheese for the ricotta cheese in this recipe would you recommend large or small curd? I presume the same qty would be okay? Cottage cheese will be okay. I recommend using smaller curd. I tried this recipe tonight for dinner and it was a great success! I didn’t have a springform pan so I use a Corningware casserole dish. Will definitely make again! Followed it exactly even using your spaghetti sauce with umami and it turned out beautifully and tasted even better then it looked I used stackable pans so I could make two at once. Thank you so much! Happy to hear how well it turned out! Another amazing recipe Amy and Jacky – oh, how I wish you two would publish a book for sale on Amazon…I can think of at least 6 people first hand I would have gifted it to this Christmas. Your recipes are always spot on (as we say in England), and this one is too. We are STUFFED! I made the recipe exactly as stated, including the spaghetti sauce recipe first, and I hope you don’t mind me adding a suggestion that perhaps you could try, and if it works for you, maybe add a footnote somewhere? My better half is Sicilian, and after 20 years together, I am still trying to ‘better his Mum’s cooking in my head’ when I cook any type of pasta dish. With lasagna, I have a secret ingredient that he loves! Both the sauce and the ricotta mix in your recipe require dried herbs that are the same (dried basil and oregano feature heavily in Italian Seasoning), and so whilst this was cooked to perfection, it was very ‘herby’. Next time I make this, I will drop the teaspoon of Italian seasoning in the Ricotta mix, and replace it with ground nutmeg (I usually grate half a nutmeg into the white sauce, but I imagine 1/4 teaspoon of ground nutmeg would suffice). If you’ve never tried this, please, I urge you to give it a go. You end up with a slightly sweet layer between the savoury sauce, instead of a very ‘herby’ tasting lasagna. Delicious but I had a problem when I took it out of the Instant Pot. I left it for about 15 minutes so it would firm up but when I took it out of the Fat Daddy pan with the removable bottom it began to slump. So following the suggestion of one person who wrote in I put it in a 400 degree oven, but that made it slump even more and made a lot of the juices come out and pool on the plate. Wondering what the best way is to firm it up. thank you for your feedback and question. Your red sauce may be a bit too thin. That will cause the pasta from sliding out. What is a “spring” foil? And can you use a cheesecake pan? A sling foil is folding a long piece of foil in three. You place that underneath the pan so you can lift it out easier. absolutely delicious and so easy! Made tonight. Used my own ‘spaghetti sauce’. Noodles seemed under cooked, so went to look at reviews. Not sure if a bit more time or if letting it sit longer prior to serving might have helped. I used Tarket brand (Market Pantry) oven ready noodles. I didn’t think the 7″ pan would make a lot, but it was plenty for 3, with a small bit for leftovers. I liked it, was fun to try. It was quicker overall. I will recommend adding more time (5 – 6 minutes) for this particular brand. The recipe was fantastic and easy to follow. One problem I encountered was that the lasagna noodles did not cook completely and I blame it on the fact that they were gluten free. They were just a bit chewy. If I use them again, I’ll add more time and let you know. Still delicious and will definitely do again. When you speak of a 7″ spring form in this recipe, are you referring to one with a specific depth? I only have a 2″ deep one and I’m wondering if it will be big enough to hold all the ingredients. We used a 7″ x 3″ pan. I believe you can skip one layer with the 2″ pan. Haven’t made yet. But question what type of noodles you are using. 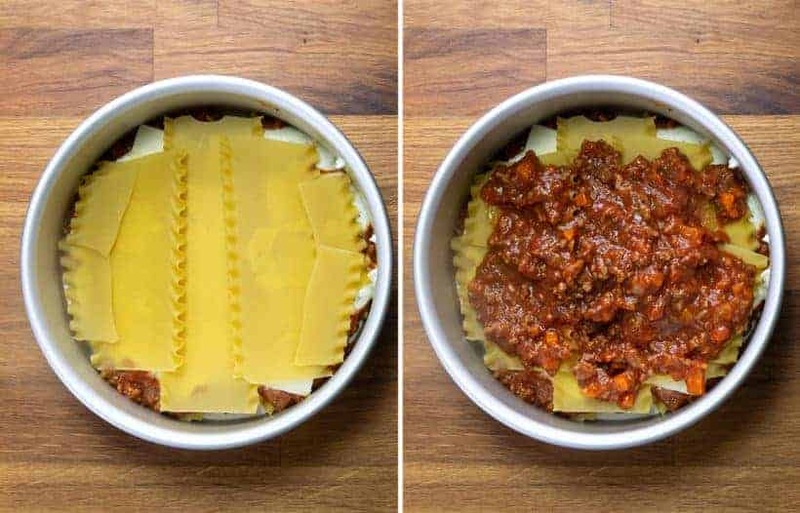 It looks like in your photos you are using “no- bake lasagna noodles” and also regular lasagna noodles in one of your final photos. Am I right or wrong? Could lasagna noodles that you would use if making lasagna in the oven be used in Instant Pot? We used oven-ready Lasagna noodles (No-boil Lasagna) for the recipe. I made the lasagna and followed the recipe exactly. It turned out great!! Everyone in the family told me that I can definitely make it again.😉 I have a stackable pan and will double the recipe next time. Do you think I should add more more cooking time? Just a couple more minutes should be enough! I’m not sure what happened but I followed the directions and all of the pasta was undercooked—one piece even crunchy—and it fell apart when I released the pan and not all of the parmesan melted. Maybe more time is needed? If the parmesan cheese has not melted, it means the pressure cooker did not get up to pressure properly. Any chance the lid was push down? It was delicious! The family loved it and it was dead easy to make and ready in no time! Made it as directed and it came out as promised. Whole milk ricotta gave it a silky richness. Using the broiler for 9 minutes gave it just right amount of color on top. My pan had a removable bottom, but the sides were fixed – not spring form. I set the finished lasagna over an upturned vase and pushed the sides down to release it. That worked fine.. The recipe is just right in size for dinner for two (twice), or dinner for 4 noderate eaters. Bottom line is we will be making this again. I have NEVER liked lasagna. I HATE making it. My husband loves lasagna though, so I tried yours and not only was it SO easy to make, but it was delicious! I am now a lasagna fan – thank you!! Happy to hear you are a lasagna fan now!! has turned out wonderful! Especially the baby back ribs – YUM! I have a new 8qt Instant Pot Lux, and a 9″ springform pan that just fits inside. Not so tight that I need to force it, but not much around the edge between the pan and the side of the IP pot. Will this be ok to use? Thank you in advance! It will be okay to use! 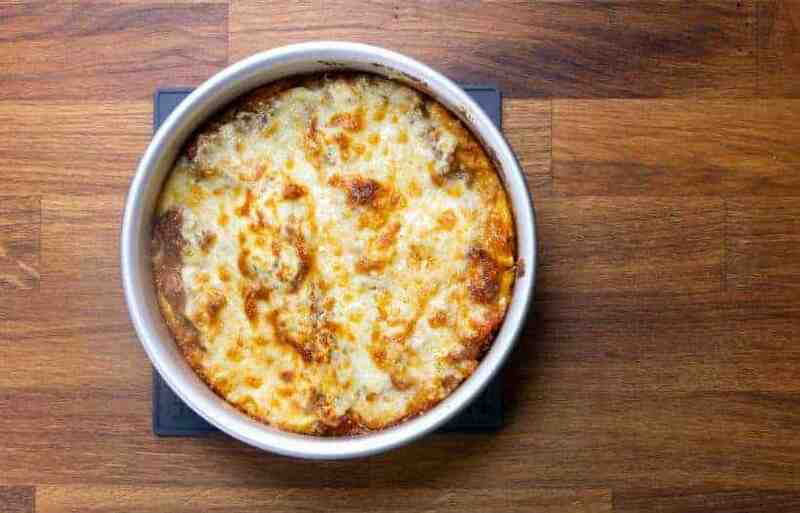 This is one of the best lasagnas I have made, and its not just because the sauce in this recipe is amazing, but because Amy and Jacky do so much to make sure that all their recipes are tried and tested until they are just perfect! I appreciate all the hard work it takes to do what they do, and have never had a bad dish yet! I have the QuCrow Stackable Steamer Insert Pan. 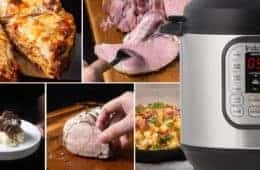 Would I be able to use one of these to make this recipe? Thank you! It will work, but it will be quite hard to take the Lasagna out. I’m wondering if anyone has used a glass (corningware) casserole for this, and if it works. Would I line the casserole with foil so it might release better? Or just leave it right in the casserole? I’m guessing it might fall apart when trying to cut and serve. Lining the casserole with foil will work better. You will want to increase the cooking time by 5 – 7 minutes as glass transfers heat slower. Made it this weekend, family loved it!! I used fresh pasta sheets as I couldn’t find the other one. Will make again. So good and so easy! Thank you. Happy to hear your family enjoyed it as well! Yes, you will want the meat sauce, ricotta cheese mixture, and shredded mozzarella cheese in addition to the Parmesan cheese. Hope you have been doing well! Sorry to hear what happened. Do you remember the brand of the lasagna? It could be the brand is not suitable for the recipe and will need some testing. I wasn’t able to find a way to reply to your comment, so I am replying to mine LOL. I used the Aldi oven ready lasagna. 10 extra minutes in the oven, covered with foil and now it is perfect. All the extra liquid is gone and now it looks like your picture. As someone else mentioned, it should sit for several minutes before removing from the form. I guess this way it can soak all the extra liquid. Despite the small hiccup your lasagna is a win. thank you so much for letting us know what brand it was. Happy to hear how it turned out at the end as well! This really speeded up cooking delicious lasagna! I made my own tomato sauce because I didn’t have spaghetti sauce on hand, and used some parmesan cheese on top to give it a nice texture. Browning in a hot oven is a great help, if you can do it. a 7″ pan produces only a smaller amount than a baking pan, of course. Next time, I plan to stack two nesting pans that I have for one-pot dinner cooking, which will give us enough for more delicious leftovers! I love this idea…it’s a keeper. Delicious! Used my own sauce recipe; Italian sausage from local grocery. Found the 7″ spring form to be under-sized for the layers (7″ diameter x 2.3″ height). This lasagna was sooooo good that I’ve purchased the recommended Fat Daddio’s 7″ x 3″. Now also considering buying an 8 qt Instant Pot (bigger lasagnas AND cheesecake #17!) for entertaining guests…my 6 qt IP only serves two people with this recipe (plus one serving of leftovers). Can I used a glass casserole dish instead of metal in my instant pot??? 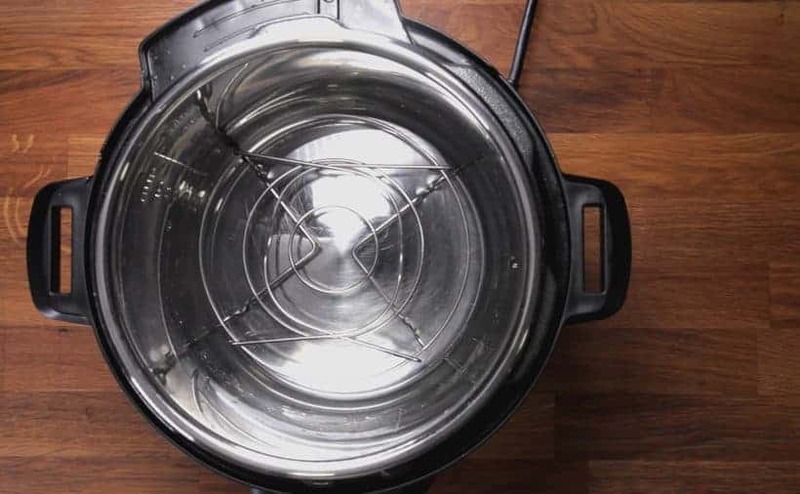 From experience, oven safe glass should be safe in the pressure cooker. Most manufacturers have not specially say if they are 100% safe in the pressure cooker so please keep that in mind. Tonight I made the this lasagne for the second time. The first time I followed the recipe to the letter and it was incredible, but as I said in the comment earlier…Lasagne with Umami Chili would be awesome and it was. The lasagne was very tasty to begin with, but with the chili as the base it was a notch above. Thanks for a great lasagna recipe. I made it tonight. We enjoyed it! Please take care & have a great day! OMG this was fabulous! It was soooo easy to make and so delicious; we both have happy tummies right now! I didn’t have time to make the Instant Pot Spaghetti Sauce, so I used one of our favorite bottled sauces and added some crumbled turkey Italian Sausage. I loved that you put Italian seasonings in the ricotta mix; that gave the lasagna such a depth of flavor. I will post the photos of our lasagna on Face Book. Wish I could give this recipe 10 ⭐️ ! P.S. Keep those recipes coming! Thank you so much for your kind words once again! Amy I just made this for dinner and everyone loved it! We are Italian so the bar was pretty high. Only thing i can think of adding next time is some grated parm in the ricotta mix. I did put it under the broiler for a few minutes but I think it will be great without this step as well. Grated parm will be great in the ricotta mix! I made it with my 3 year old grandson. I sent it home with him for his mom and dad. They loved it!! Easy great recipe. Happy to hear you family enjoyed this! I prefer regular pasta, not no boil, a d I make my own sauce. I made my sauce a little extra watery. The whole thing the perfect texture after cooking and I skipped the broil. Made your lasagna tonight. I followed the instructions to the letter and it turned out great in my Fissler 8-quart stovetop pressure cooker. I added some cooking time, as you recommended for 8-inch springform pans and waited 15 minutes to let the pasta “cake” settle after the browning session in the oven. I would just add one tip to your instructions: make sure you also wrap the bottom of the springform pan in foil to prevent leakage. I am very impressed with your website, mostly by the fact that your recipes always work in my stovetop cooker! Thanks for your exploration of this great time-saving tool! Thank you for sharing this tip with our readers as well. This will be really useful! Please take care & have a great week ahead! Fairly new to the IP world and live your recipes (and your candor). Oven ready padta is not a thing where we live (Mexico). Can you suggest a way to make this recipe using traditional dried lasagna noodles? We haven’t tried using dried lasagna noodles, but a reader of ours have tried it with success. When you say:Optional: “line a 7-inch springform pan with cut out parchment paper” do you mean to cut the parchment paper in a circle to fit on the bottom and why is it optional? Yes, please cut the parchment paper in circle so it fits the bottom. It is there to prevent sticking and a easier release from the pan. For the lasagna recipe, would the Instant Pot 7 inch silicone spring form pan work? Yes, it will work fine as well! Wonderful recipe. Used recommended ingredients and Classico Italian sausage & green pepper spaghetti sauce. Turned out absolutely amazing. Couldn’t get a good browning using the oven only so used hi setting on oven gas broiler and that quickly did the job. Think I’ll try my kitchen torch next time. Sliced into quarters after cooling, ate one and wrapped the other 3 portions in foil, then in saran wrap to maintain moisture in each packet. Had company (brother and his wife) for lunch 2 days later and guess what we enjoyed? Yes – the leftover lasagna with a nice fresh tossed salad. Simply reheated the 3 portions in the microwave at medium/high power (60%) for about 3 minutes. They came out piping hot and everyone was very pleased with their lunch. Just had an email from them raving about how good it was. I found a major typo: You list that this makes 4 servings when in fact, it makes only one. Sorry if I missed it and this is a repeat – by “oven ready”, do you mean the “no boil” lasagna noodles or just regular dried noodles? Thank you! No boil lasagna noodles will work fine! This was deliciously! How would you go about using fresh pasta? Haven’t tried it with fresh pasta, but fresh lasagna noodles will most likely become quite soft after cooking in the Instant Pot. I would reduce the cooking time by 10 minutes and see how it goes! I made it with fresh pasta and it was delicious. Yummy!!! Very easy to make, very tasty! Next time I’m going to add Italian Sausage… very good!! Thanks for your lovely feedback, Cindy! Glad you enjoyed the lasagna. wow ! This looks and sounds delicious! I have never made this before, so I will be saving your recipe for later. Thanks for sharing! a 6 inch push pan will work and the cooking time will be the same. 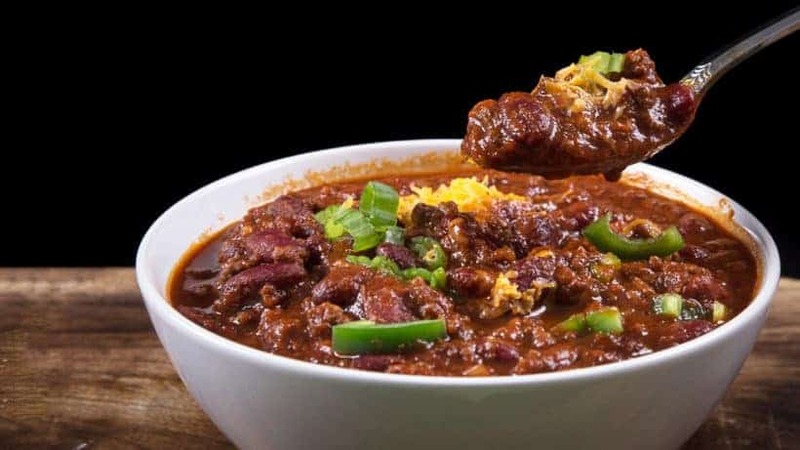 It’s the way my brain works… I have made several batches of your chili now and absolutely love it. So I’m thinking chili leftovers (actually reserved from the beginning because we rarely have leftover chili) being used instead of spaghetti sauce. Oh wait, now I have to do a New York Cheesecake #17 first so it can set up overnight and then a batch of chili….then the following night chili-filled lasagna with cheesecake. And she wondered why I bought a second Fat Daddio pan. I’m predicting sensory overload in a very, very good way! So happy to hear from you again. I was actually thinking about trying chili Lasagna a few days ago. Great minds think alike hehe! Wow! This was fantastic. I am new to the IP world and on the lookout for all the easy recipes I can make in my IP. Please know that I don’t like to cook, but I cannot eat gluten so I have to go more cooking at home. I made this with a protein base gluten free no boil lasagne. Turned out delicious. I used a 5 cheese blend, along with low fat ricotta. Everything turned out so good. To brown the cheese I placed in my Air Fryer on 400 for 10 minutes. I am enjoying this dish while writing this comment. Yum! Happy to hear gluten free pasta worked as well! Just finished making this and it turned out great! 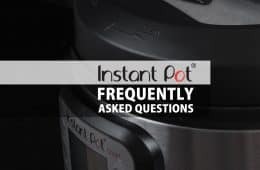 Your website has been my go-to ever since I received my instant pot. All of your recipes have been very easy to follow and every single meal has been delicious! Thank you and I wish you the best! 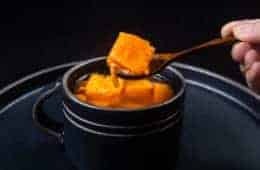 I’ll bet that I could use my butane torch (used to caramelize the sugar crust on the creme brulee that I frequently make using your amazing IP recipe) could also be used to brown the top of this delicious dish. What do you think? My new springform pan just arrived yesterday, so I have the shopping list made up for making this lasagna later in the week. I have a 8” push pan for my 8qt duo. Can you provide recommendations on how to increase the ingredients and cooking time, please? Hoping to make this tonight because I have all the ingredients! You will probably want to 1.25 – 1.5x the recipe. The cooking time should be increase by roughly 3 minutes. Could this be made using GF pasta? It looks delicious! We haven’tried this recipe with GF pasta, but as long as it is oven-ready, then I think it will work just fine. The recipe will work just fine with no adjustment in the 8 quart. I was wondering about the ground beef. The recipe shows no meat but the tags list “ground beef instant pot recipes” Could you add ground beef to the spaghetti sauce when assembling? Thanks for all the great recipes you research so carefully. I am making your tomato soup today. The spaghetti sauce recipe we use have ground beef in it. You can also add ground beef to your favorite spaghetti sauce when assembling. If I wanted to make and freeze this recipe, ahead of time, would you cook it first? Or could I make it uncooked, wrap in foil, and just add it to my IP and cook? Would I use the same cooking time? Thank you in advance and love your site. Freezing it uncooked will work better in this case. You will probably need to increase the cooking time by roughly 6 – 8 minutes. Do you need to cook the ground beef seperate? Sauteeing the ground beef first will make them more flavorful, but you don’t have to cook the ground beef separately. Can this be made in a 6 inch? 6 inch pan will work as well. No egg will be fine. Hiya! I was wondering if you could use cottage cheese in place of the ricotta cheese? I found that 1# ground beef was too much. I browned it in my IP with some garlic salt and onion salt and Italian seasoning and used about half the meat and froze the rest. I just layered it on top of the sauce layer. This will be useful for our readers looking to add ground beef to their favorite sauce. And my dad is recovering well at home. Thanks for your care! Hope things are well with you too. Have fun making the lasagna in Instant Pot & let us know how it goes! Have an awesome week! I made this tonight. It was delicious. One tip I learned. I would let the lasagne set for 15 minutes before slicing. Happy to hear you enjoyed it. Was the lasagna too hot to handle? I use an 8″ springform pan in my 8 quart Duo. 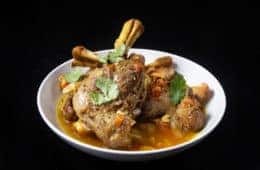 Can you recommend increasing the ingredients and/or cooking time? Thank you. How long would you cook this for if you put it in a stacking pot? Can you show me what the stacking pot looks like. Hi! Great recipes 😄 thank you for sharing! I am new at the IP coming and I have the IP Ultra. You mention the natural release and these release things confuse me like crazy. I see in the pics you have the older model of the IP. How does the natural release transfer to the ultra? The pressure release really confuses and scares me. Any help would be appreciated lol! I will def have to try this recipe!! Esp after I figure out the pressure release lol. It looks so amazing! Natural release means you don’t do anything until the floating valve (metal pin) drops down on it’s own. Do you have a favorite store-bought sauce or are you using one you make? We usually have a batch of our spaghetti sauce in the freezer so we are using the one we make. Please take care & I will see you around! Love your website! Would I need to change the cook time if I wanted to add ground meat to the lasagna? Also, do you think 1 pound of ground meat would be too much? I will probably be making this in my 6 quart Instant Pot instead of my 8 quart Wolfgang Puck pressure cooker(the I.P. just seems easier to use, to me at least). Thanks for your help and keep the great recipes coming! The spaghetti sauce we used have ground beef in it already. 1 pound of ground meat will be perfect. The cooking time will not need to be changed.